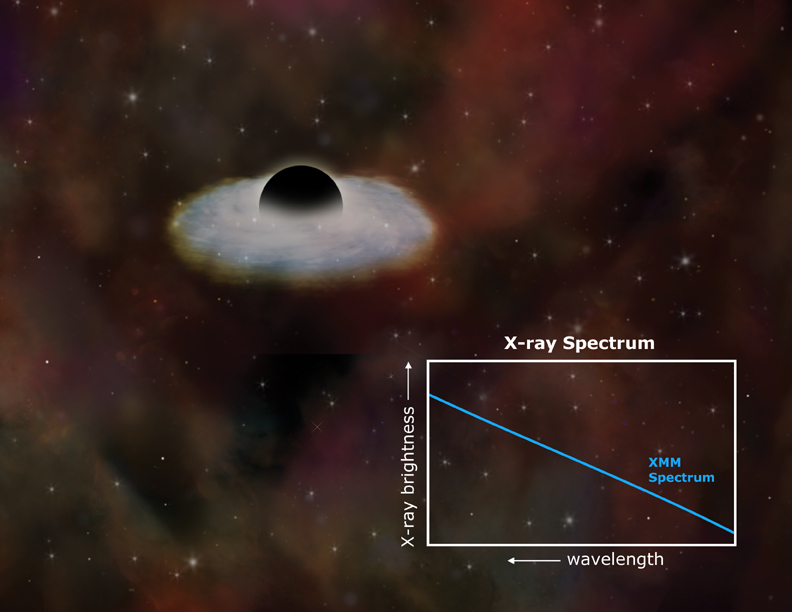 X-ray data from Chandra, the European Space Agency's XMM-Newton, and the German Roengtensatellite (ROSAT) X-ray observatories provide direct evidence for the catastrophic destruction of a star that wandered too close to a supermassive black hole. The accompanying illustration (top) depicts how such an event may have occurred. A close encounter with another star put the doomed star (orange circle) on a path that took it near a supermassive black hole. The enormous gravity of the giant black hole stretched the star until it was torn apart. 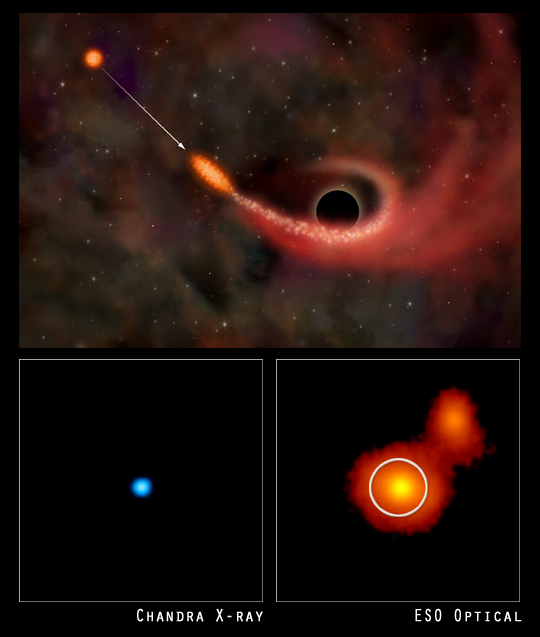 Because of the momentum and energy of the accretion process, only a few percent of the disrupted star's mass (indicated by the white stream) was swallowed by the black hole, while the rest of was flung away into the surrounding galaxy. Observations with Chandra (lower left image) and XMM-Newton, combined with earlier images from ROSAT, confirmed that a powerful X-ray outburst had occurred in the center of the galaxy RX J1242-11, which appears normal in a ground-based optical image (lower right, with the white circle defining the location of the Chandra image). This X-ray outburst, one of the most powerful ever detected in a galaxy, was caused when gas from the disrupted star was heated to multimillion degree temperatures as it fell toward the black hole. The force that disrupted the star in RX J1242-11 is an extreme example of the tidal force caused by differences in gravity acting on the front and back of an object. The tidal force from the Moon causes tides in the oceans on Earth, and tidal force from Jupiter pulled Comet Shoemaker-Levy apart before it plunged into the giant planet. The tidal disruption of a star is estimated to occur about once every ten thousand years in a typical galaxy. As astronomers accumulate observations of thousands of galaxies, many more of these events should be detected. Scale Image is 25.0 arcsec across. Coordinates (J2000) RA 12h 42m 36.90s | Dec -11° 19’ 35.00"